I was extremely happy to see Daytona USA back in the arcades last year, and it’s awesome to see the return of another classic Sega franchise. 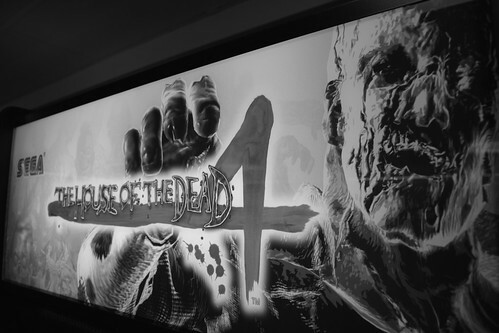 Arriving twelve years after last installment, The House of the Dead: Scarlet Dawn was location tested last month in Japan and the game was showcased at the Japan Amusement Expo 2018. These promotional masks were given out to JAEPO 2018 attendees. 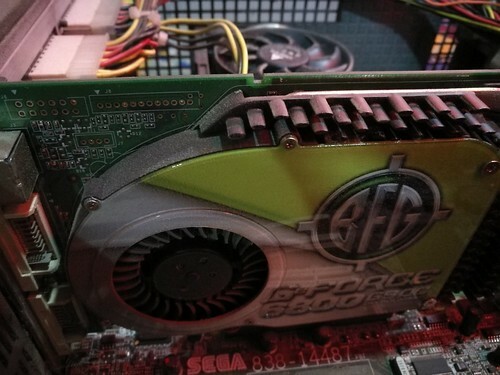 I was fortunate to win one from the Throwback Tokyo – Gaming in Japan Facebook group. 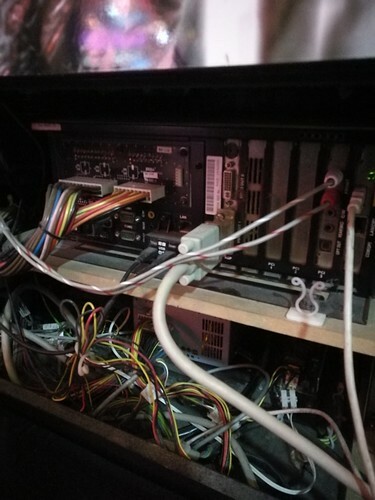 It’s testament to the quality and popularity of the series that machines can still be found in many arcades around the UK. The games play well and are still loads of fun today. 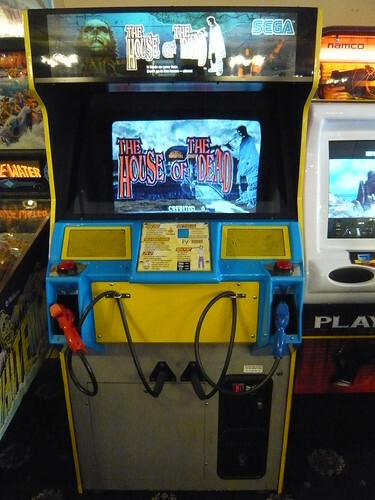 This awesome The House of the Dead trio is currently on location at the Grande Pier, Weston-super-Mare, UK. 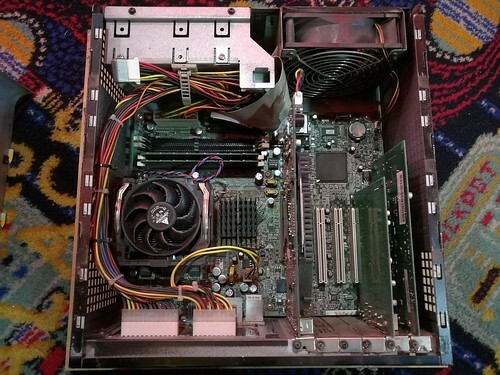 Here is a look back at the series, with pictures of machines I have played over the years. The plot revolves around Dr. Roy Curien, a renowned biochemist and geneticist, reportedly obsessed with discovering the nature of life and death. Yes, that old chestnut! Agents Thomas Rogan and “G” are tasked with investigating Dr. Curien’s Mansion. His experiments have driven him insane, resulting in him releasing the subjects into the world. Well you knew it wasn’t going to end well! Combining the first-person rail shooter game play of Virtua Cop with a horror zombie-survival / B movie theme, the game was an instant hit. With its gruesome visuals and cheesy voice acting, the game was a complete departure from anything Sega had released before. It’s hard to believe the game was released 22 years ago! The House of the Dead Standard ‘Midi’ cab at Hemsby, UK. 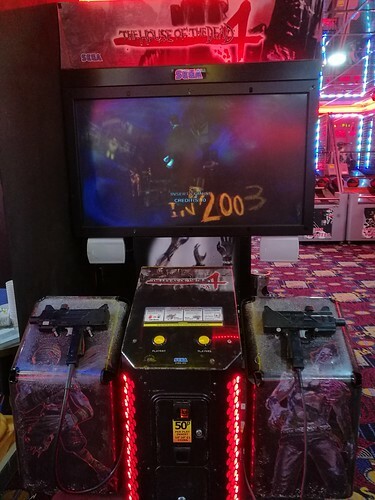 This machine at Hayling Island, UK appears to be a Virtua Cop conversion. 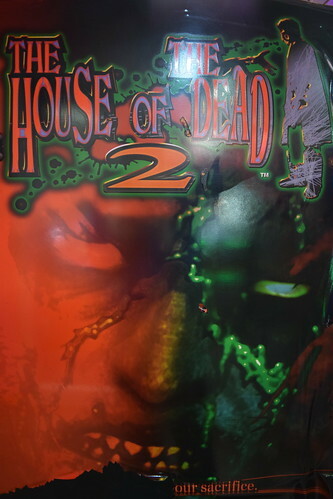 Set fourteen months after the 1998 Curien Mansion incident in The House of the Dead, the game takes place in 2000 on the streets of Venice following a zombie outbreak. Goldman, the man who funded Dr. Curien, is responsible. Agents James Taylor and Gary Stewart are sent to stop him. 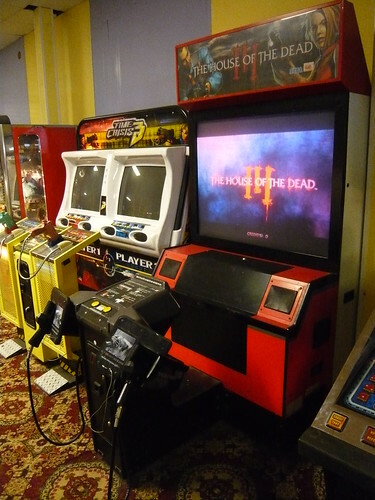 The House of the Dead 2 Super Deluxe cab on Great Yarmouth seafront. I picked up the awesome THOTD2 Gun Set for the Japanese Dreamcast upon release. If I remember rightly it was from ACE, a video game import shop down one of the small side streets off Carnaby Street, London. I was blown away by the conversion and I still have the game today. This game has also proved very popular with my little girl. 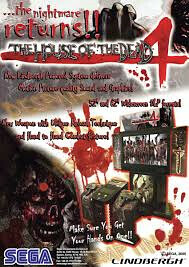 The House of the Dead 2 Upright at Hermanus Leisure, Winterton-on-Sea. 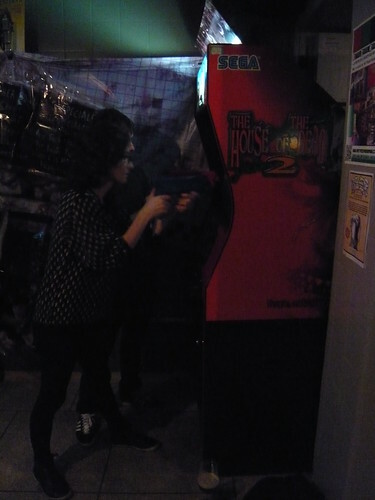 Gunning down zombies on a night out in Peckham at The Four Quarters. The third entry in the series is set in the post-apocalyptic year of 2019. Players take control of Lisa Rogan and Agent “G” as they search for Lisa’s father, Thomas Rogan after he goes missing when embarking on a mission into a mysterious facility. This time players are armed with a shotgun to take out the hordes of crazed zombies. The game features time-sensitive game play and a wide variety of branching paths. The first and third installments at Weymouth, UK. 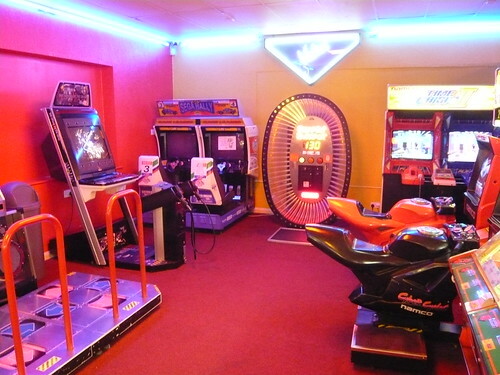 This arcade at Hemsby had The House of the Dead Naomi Upright, but sadly it’s no longer on site. 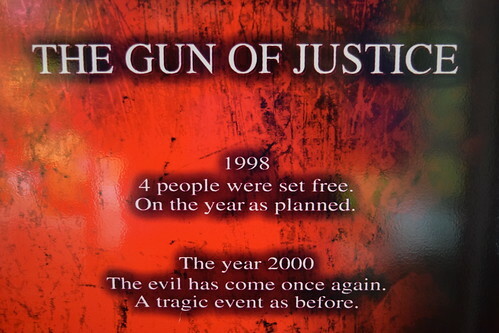 This is set in the year 2003, between the events of the second and third installments. Agent James Taylor and newcomer Kate Green are investigating the Goldman Incident of 2000 and gathering intelligence at the AMS European headquarters. There is a sudden earthquake which leaves them trapped, and they are shocked to discover that the undead from three years prior have returned. Talk about having a bad day! The Uzi submachine gun is the weapon of choice, and players also have grenades at their disposal. The action is unrelenting and at times there are dozens of enemies simultaneously on-screen. 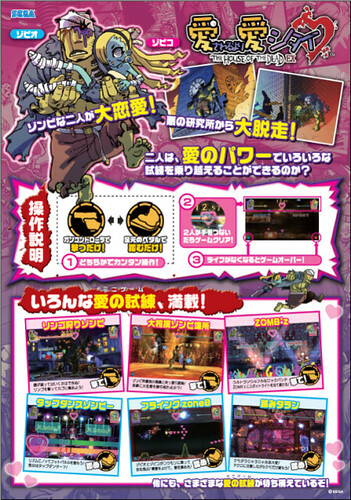 The game also features branching paths and has a critical shots counter, encouraging the player to go for headshots. 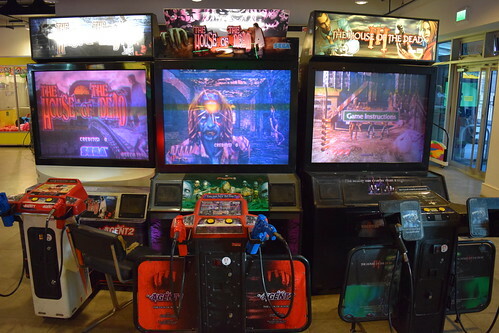 The House of the Dead 4 Super Deluxe cab at Sega Joypolis in Odaiba, Japan. I love the gruesome cabinet details. Truly horrifying, in a good way! 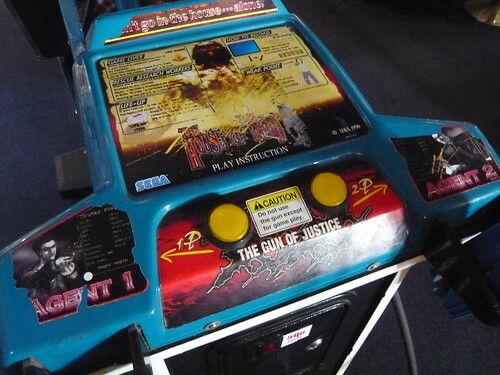 It’s also notable for being the first arcade light gun game to feature a high definition widescreen display. 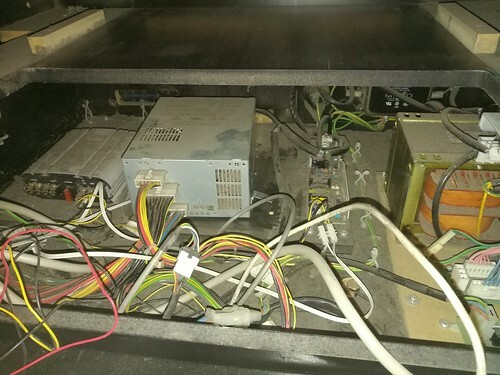 Here is the Deluxe version on Great Yarmouth seafront and some pics of the internals. 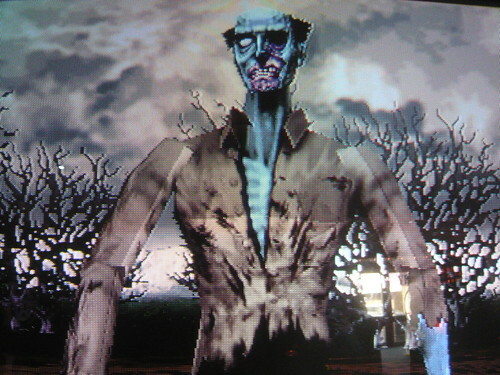 The game takes place shortly after THOTD4, with Kate Green teaming up with Agent “G” to destroy the zombie infestation at its source, leading them to confront the Magician, a boss character who returns after having been destroyed in the first two installments. 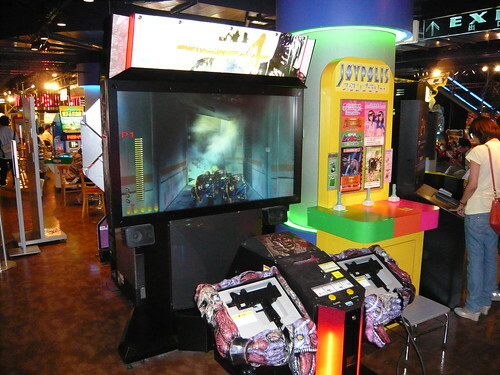 I absolutely loved playing this at Sega Joypolis in Odaiba. Before the game commences, players sit down inside the theater unit, buckle up and are given a short safety brief. This reminded me of those pre-flight safety briefings, except all in Japanese. 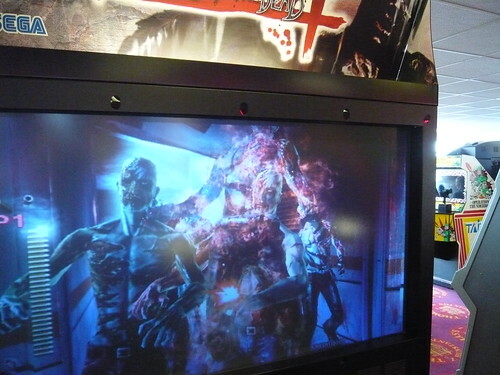 Two 100-inch screens are utilised, one in front of the players and another behind, and the seat automatically rotates to face the players towards whichever screen the zombies are attacking from. The seat shakes during attacks, and players are blasted with air when damage is sustained. 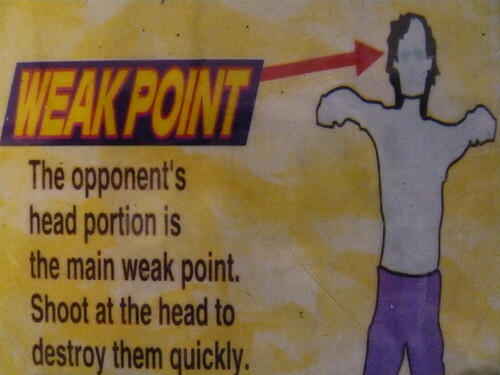 The game features a life bar and there are no continues. In a two-player game, players are judged on how compatible they are. The game is fantastic fun and unintentionally hilarious! 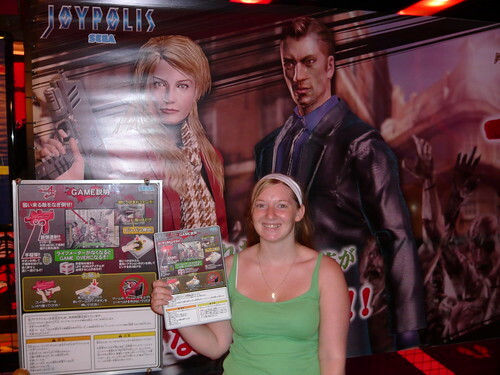 My wife posing with the instruction card at Joypolis back in 2008. 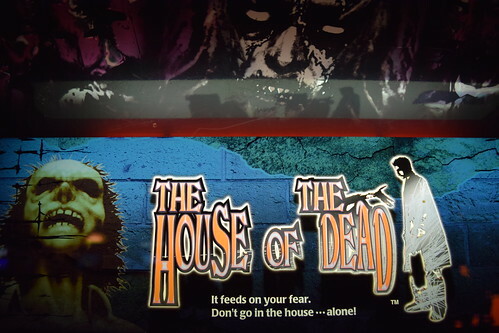 There has been a couple of The House of the Dead arcade spin-offs: The Typing of the Dead (1999), Zombie Revenge (1999) and The House of the Dead EX (2009). 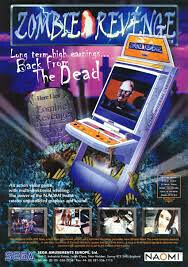 The only one I’ve played is Zombie Revenge, a cool beat ‘em up which was sited in a local bowling alley back in the day. Interestingly the game is a collaboration between Sega AM1 / WOW Entertainment and Data East, although the exact involvement of the latter isn’t clear. The plot involves AMS agents being sent to Woodside City to eliminate the undead and track down the leader behind the attack, the mysterious ZED. There are various references to the original game. These include the Curien Mansion appearing as its own stage, and the final boss is Black Magician Type 01, clearly based on the Magician. The game runs on Naomi hardware. 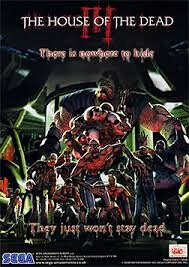 I would really love to play The House of the Dead EX. From what I’ve read the game has a more light-hearted, comical vibe. The protagonists are Zobio and Zobika, a pair of young zombies in love, who seek to escape from captivity. 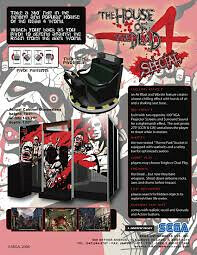 The levels are made up of a series of minigames, similar to Namco’s Point Blank, and the game also uses a foot pedal. 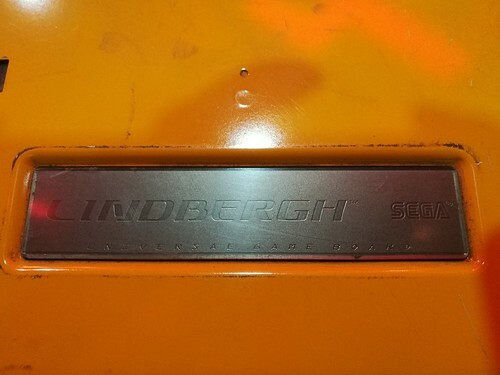 It runs on Lindbergh hardware and was only released in Japan. 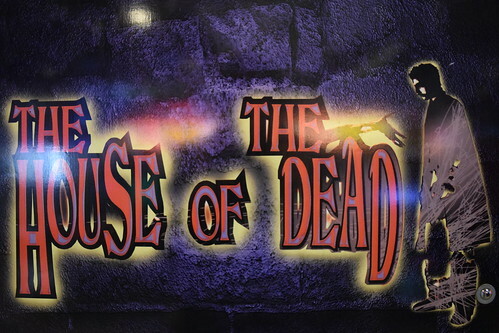 The first installment and The House of the Dead Special made the biggest impact on me, and I consider them my personal favourites of the series. 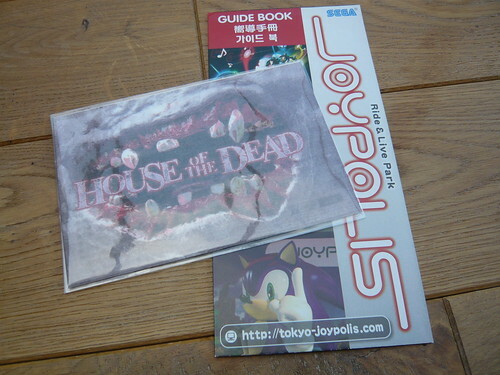 I can’t wait to see how Sega will continue the series with The House of the Dead: Scarlet Dawn. Hopefully we won’t have to wait too long to find out! 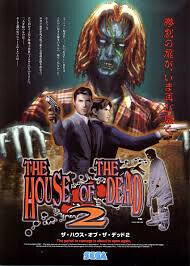 Great look back on the House Of The Dead series! I've always preferred the Time Crisis games, but that's not to say I don't like HotD. I'm hoping that Scarlet Dawn reaches our shores, as the gameplay looks to be a more refined version of the 4th game- which I liked but could be improved on. 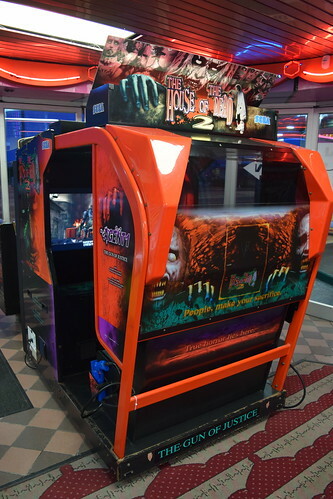 There's a Super Deluxe HotD 2 near me at Derwent Amusements, Matlock. The gun calibration was way off for quite a few years, but thankfully it seems to be fixed as of this year. The rear projector is still working which is great, although it certainly isn't what it used to be. Hi Ted. I also enjoy the Time Crisis series, although I haven't played very much of the fifth entry. The earlier titles seem to be getting increasingly scarce, especially the first game. Hopefully Scarlet Dawn will reach our shores. I'd wager that there is a good chance given the theme and popularity of the series. 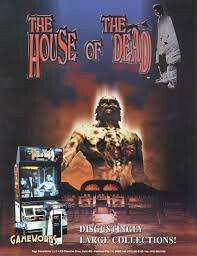 It's cool that they still have The House of the Dead 2 Super Deluxe in Matlock. There can't be many of these around. It's a cool cab, great fun and the Naomi powered visuals hold up surprisingly well today. I agree, HotD 2 still holds up. Planet Fun in Ingoldmells used to have the Deluxe cab, it had a very good LCD conversion and looked great on it. Sadly they got rid of it at some point after 2013, as well as their Crisis Zone DLX. Blackpool Pleasure Beach still have their Deluxe but there's no sound and only the second gun works. As for Time Crisis, I still do see it a lot. 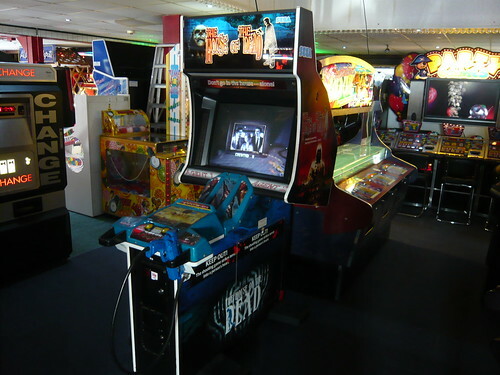 Time Crisis 5 definitely hasn't appeared in many arcades here, though I have played it at Namco Funscape in Manchester and North Pier in Blackpool. The left and right pedals take some getting used to but it's another solid entry in the series. 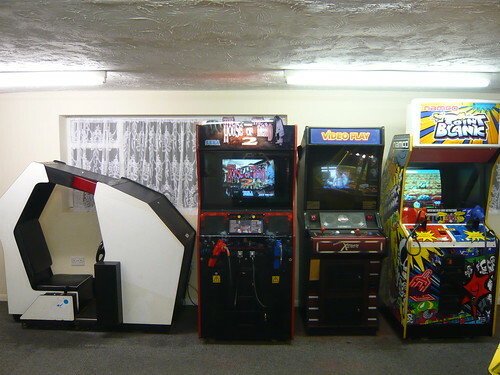 Other than that I do still see the other games fairly often, The National Videogame Arcade in Nottingham has the original and I saw Time Crisis 2 quite a lot last year; Funland in Whitby has a really nice Deluxe cab and Fairworld Amusements in Cleethorpes had one that offered 3 credits for £1, really great value. 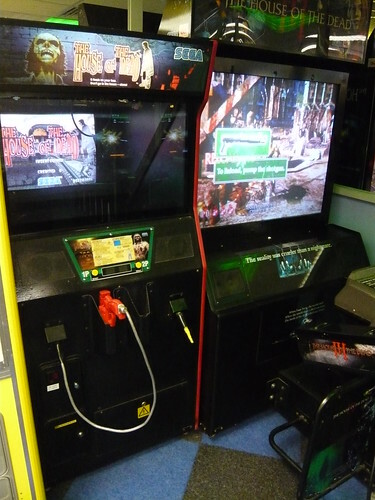 I haven't seen Time Crisis 3 a lot though, I believe Skegness Pier sold theirs last year.